Hi Brides-to-be! 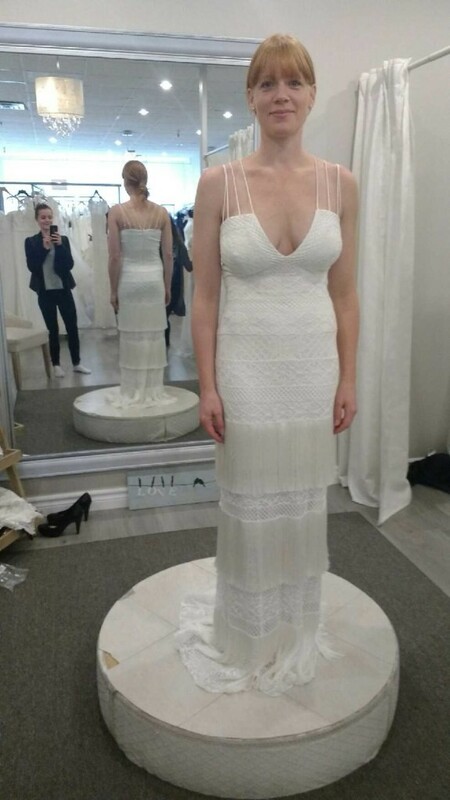 I purchased this dress a year ago thinking it'd be perfect for my summer wedding but then I ended up finding a dress that my mother liked better (have to keep Mom happy), so needless to say this is a never-been-worn before beauty. It's got a 1920's flare to it with the tassels at three points on the base of the dress. It's a nice stretchy material, so it's really comfortable to wear. My original plan was to add some structure to the top so that I could wear it as a strapless so that's an option if you'd prefer it without straps. It's a great dress though, and I paid a really reasonable price. Likely needs to be shortened, depending on how tall you are. I'm 5'7 and I needed 3-4 inch heels to avoid alterations. Also may need to structure in the top (cup inserts, a sheer piece to pull the deep-v together, structure to remove the straps, etc. - depending on your preference).